A: Set up college scholarships and expand as fast as you can. Start spreading the music from coast to coast! Raise more money and buy more guitars! That’s what this is. Since 2009, we've made it our mission to give kids and teens a voice through music by providing guitars, drums and support for music teachers. Musack makes music happen with programs in Nantucket, Los Angeles, Compton, Appalachia, Cuba, Australia, Alaska, New Mexico, and Haiti, all with huge support from our annual Rock n’ Roll Carnival backyard music festival featuring our talented musician and comedian friends. To Woody Guthrie, "This Machine Kills Fascists!" To us, "This Machine Makes Music Happen!" What is this machine to you? We make music happen with support from people like you! But we like to have fun while doing it and enlist the help of our talented friends. Every year we throw our own mini-Coachella, complete with bands, kids' activities, food, art, comedy, and a silent auction of rock n' roll memorabilia in a sprawling Los Angeles backyard. Past lineups have seen acts like She & Him, Rancid, Fishbone, English Beat, Weird Al, Superchunk, Yo La Tengo, Deltron 3030, Billy Bragg, DJ Lance Rock, Tom Kenny (Spongebob), Lisa Loeb, Childish Gambino... the list goes on and on. This year's exclusive event is on August 25th with Questlove, Tim (from Rancid) in a Tree, Flavor Flav, & more! Musack is thrilled to announce our largest donation yet - 250 guitars to our friends at The Songbirds Foundation. 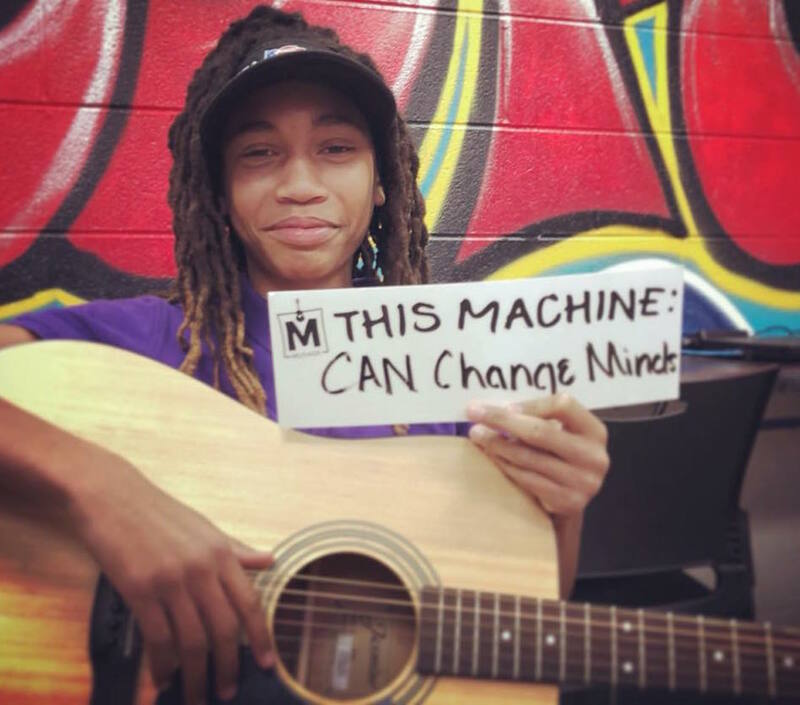 What do we do when we give a guitar to a program and see them grow with enthusiasm? We visit and bring more instruments - guitars, violins, mics, and ukuleles! Looking for photography to brighten your walls or books to make you smile? You're going to want to check out Photos and Books by Lorin Lee Cary. Half the proceeds from the sale of any photo go to Musack! We have about one month left in 2017, and so far, we've given more guitars (and drums and banjos!) than ever this year! We've continued supporting our programs in Nantucket, LA, Compton, and Haiti with supplies, plus added banjoes to Folk School JAM in Appalachia! You may know Nan Coffey from her Mighty Mighty Bosstones collaboration. You may know Nan Coffey from her Horace Panter collaboration. You may know Nan's rad "Art All Over" style already, but no matter where you know her art from, we're so stoked to share more about the Nan Coffey + Musack collaboration. Join us online Thursday, October 5th for a special benefit auction featuring albums, instruments, and memorabilia signed by some of your favorite musicians and stars, plus amazing examples of Pre Columbian and Ethnographic art from Donick Cary’s private collection.